Winmate is proud of becoming one of the first IPC companies to unveil a series of Intel Sandy Bridge Platform Tablet PC based on Intel 2nd generation Core i5-2557M / Core i7-2610UE processor. 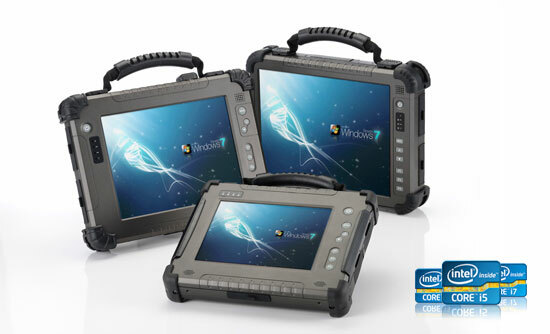 Winmate’s Rugged Tablet PC family is built with durability and stability in mind; sustainable in the toughest of environments. The new released products include: 10.4”、12.1” Rugged Tablet PC and Mobile Rugged Tablet PC, which has additional 3G function than the previous ones. 2nd generation Intel Core i5 / i7 processor delivers additional features and capabilities over Calpella in the area of media and graphics and digital display options. As Intel Core i5-2557M / Core i7-2610UE has high performance with low Thermal Design Power(TDP) only 17w, Winmate has designed a special adjusted heat pipe system to ensure stable and reliable operation without using any fan. The temperature range is from -20 degree to 50 degree, depending on the model and housing type.